Rubber declined for the first time in four days, retreating from a four-month high, as data showed slower-than-estimated growth in U.S. personal incomes and the yen resumed a rally against the dollar. Futures in Tokyo lost as much as 2.4 percent after yesterday reaching the highest level since April 30. The contract is headed for the steepest monthly gain since February, and has climbed 6.5 percent this year. The Japanese currency resumed its climb, threatening the nation’s export-led recovery, even after the Bank of Japan moved to expand its lending program. U.S. incomes rose 0.2 percent in July, less than the 0.3 percent median estimate of 66 economists surveyed by Bloomberg News. February-delivery rubber lost as much as 7.2 yen to 292.3 yen per kilogram ($3,467 a metric ton) before settling at 293.8 yen on the Tokyo Commodity Exchange. The yen appreciated to 84.06 per dollar from 84.62 in New York yesterday, weakening the appeal of yen-denominated contracts. Stocks and oil declined as U.S. data heightened concern that the economic recovery may stall. “People are concerned that the sluggish growth in U.S. personal spending would have a negative impact on the world economy because exports of Japan, China and other Asian countries count on it,” said Fumiyuki Nakanishi, a strategist at Tokyo-based SMBC Friend Securities Co.
Crude oil headed for its first monthly decline since May. Lower oil prices improve the appeal of the commodity used to make tires against rival synthetic rubber made from petroleum. “Crude oil prices continue declining, dampening sentiment for the rubber market,” Varut Rungkhum, an analyst at commodity broker Agro Wealth Ltd., said by phone from Bangkok. 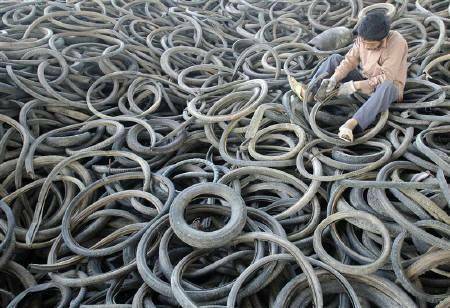 In the cash market, prices in Thailand, the world’s largest rubber producer, dropped 0.5 percent to 106.85 baht ($3.41) per kilogram today as weakening U.S. economic data raised investor concerns over the global economic recovery, according to the Rubber Research Institute of Thailand. The price was supported by limited supply as rain disrupts tapping, it said. Speculation that supply from Indonesia, the second-largest producer, may be disrupted because of the eruption of the Sinabung volcano on Sumatra also supported prices. It erupted on Aug. 29 for the first time in 400 years, spewing ash and prompting the evacuation of surrounding areas. “The incident raised uncertainty about supply from Indonesia, although we have not yet heard of any real damage to production or shipments,” Saito at Fujitomi said. January-delivery rubber on the Shanghai Futures Exchange lost 2 percent to close at 25,320 yuan ($3,719) a ton. China’s inventories shrank for the first week in five, dropping by 32 tons to 24,701 tons, the exchange said on Aug. 27, based on a survey of 10 warehouses in Shanghai, Shandong, Yunnan, Hainan and Tianjin.